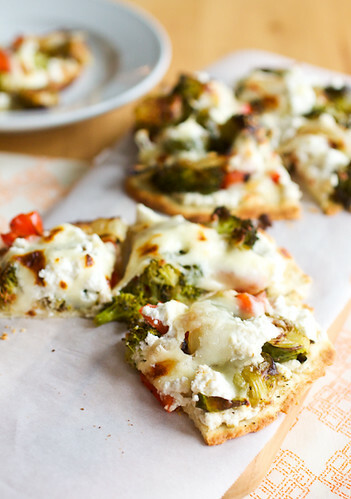 Remember these roasted veggie pizzas I shared with you a few months back? Well, they are making a reappearance this week. Not here of course, but with Fresh Dish, a company dedicated to bringing back the family table. Its mission is exactly in-line with my own here – to cook great meals at home. The caveat though, is that they do all the prep for you! Yep, you order a meal kit online and Fresh Dish preps and packages up your fresh ingredients then ships the meal kit right to your door. The meal kits come equipped with the ingredients and the instructions you need to make the meal. Quite possibly the best thing (well, next to the already prepped ingredients) is that every meal is guaranteed to be on the table in 30 minutes or less, which is totally do-able for so many recipes if you’re cutting out all the prep time! Busy weeknights are now handled without take-out or fast food – that’s certainly my kind of weeknight! Oh any by the way, pricing for the meals kits will cost you less than it will for a restaurant meal. So I’ve teamed up with Fresh Dish to work out recipes they can prep and ship to their customers and the first one is the roasted veggie pizza that Kyle and I loved so dearly. Hop over their way to see if they are delivering to your area and place an order – you’ll get $10 off your first order when you use the code SLHXFRESH which makes a $24 meal for two only $14 or a meal for 4 only $22! The buzz on their Facebook page has been amping up and I’m really looking forward to watching them expand their delivery service in the coming months – I’m told New England should be soon! Disclaimer: I am working with Fresh Dish as a consultant but was not compensated to write this post. All opinions, as always, are my own.